Very often, at Wellsford Pharmacy we will offer patients the opportunity to purchase a Probiotic with a broad spectrum Antibiotic prescription. The good bacteria contained within the probiotic may negate some of the negative effects that the antibiotic may have on your digestive system (eg: diarrhoea), genital system (thrush prevention), and general immunity. We are firm believers in supporting preventative health rather than needing to treat unwanted side effects of drugs. 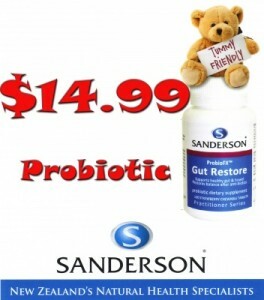 Broad spectrum antibiotics are proven to cause diarrhoea in 20% of patients, which rises alarmingly, to 40% in children.Â Sandersons Gut Restore is a great tasting probiotic with a well researched strain of a good bacteria, Bifobacterium animalis lactis BB12. It can be used from infancy (as it may be chewed or sucked)throughÂ to the elderly and comes in a 14 tablet pack that is ideal for preventative treatment with a 7Â day antibiotic script; take one a day for 7 days and carry on for 7Â more days once finished your antibiotic. Â Â It comes at a very affordable price as well,Â just $14.99. There has been a huge amount of research into specific strains of Probiotics and the incredibly important role they play in overall maintenance of well-being. We could say a lot more… would you like more information?Â Please come and ask us. Posted: March 18th, 2014 under Uncategorized.